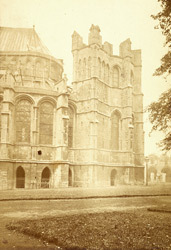 Exterior of the Corona, a small chapel of circular plan, and Trinity Chapel, at Canterbury Cathedral. The cathedral was founded in 597 by Saint Augustine and rebuilt in the Romanesque style by its Norman Archbishop Lanfranc. In 1174 a fire gutted the cathedral choir. French architect William of Sens began reconstruction work on the choir and its extension eastwards to the Trinity Chapel and Corona in an early Gothic style. The work of William of Sens was completed by William the Englishman and became of great subsequent influence in the development of English architecture. A feature of the walls of the Trinity Chapel and Corona is the large space allowed for windows which include a body of original glass from the late 12th and early 13th centuries.